In today's ever-evolving world, content management is a moving target. With content flowing from a multitude of places, keeping up with the speed of business requires a content management strategy that's more flexible than traditional Enterprise Content Management (ECM). As digital transformation forces organizations to rethink their processes, it's never been more important to focus on deploying a platform that works across all of your content so you can get more value out of each asset and protect yourself against technology stagnation. 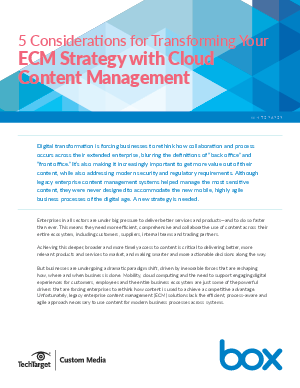 Check out our ebook, 5 Considerations For Transforming Your ECM Strategy With Cloud Content Management, and learn how to bring your people and information together in the cloud.